Japan's Keitaro Miyahara (10) is greeted by teammates after hitting a solo home run off Mexico pitcher Jorge Garcia in the first inning of the International Championship baseball game at the Little League World Series tournament, Aug. 26, in South Williamsport, Pa.
SOUTH WILLIAMSPORT, Pa.(AP) --It took only one batter to send Japan on its way to the championship game of the Little League World Series. Keitaro Miyahara smacked a leadoff home run to left-center, capping a nine-pitch at-bat and powering Japan past Mexico 5-0 on Saturday for the international bracket title. Miyahara, 6 for 12 in the tournament, slipped coming out of the box before sprinting around the bases, giving a little fist pump at third. "After the first home run off this opposing pitcher, the momentum changed," Japan manager Junnji Hidaka said through an interpreter. "Once one of our hitters got a home run off of him, we believed we could hit off him. That's a very good pitcher that we faced." Japan, with three shutouts in four tournament games, will play Sunday against Lufkin, Texas, which beat Greenville, North Carolina, 6-5 in the U.S. championship. If Japan wins, it will be its fifth championship in eight years and 11th overall. Tokyo Kitasuna, the club representing Japan this year, has won the championship three times, most recently in 2015 when it was also managed by Hidaka. Mexico unraveled after Miyahara's blast, giving up three more runs in the first. Japan loaded the bases thanks to a dropped third strike, a throwing error by pitcher Jorge Garcia and a walk before Yuya Nakajima grounded a two-run single through the left side. Another run scored on a wild pitch before Garcia escaped further trouble. By that time, he had thrown 39 pitches. 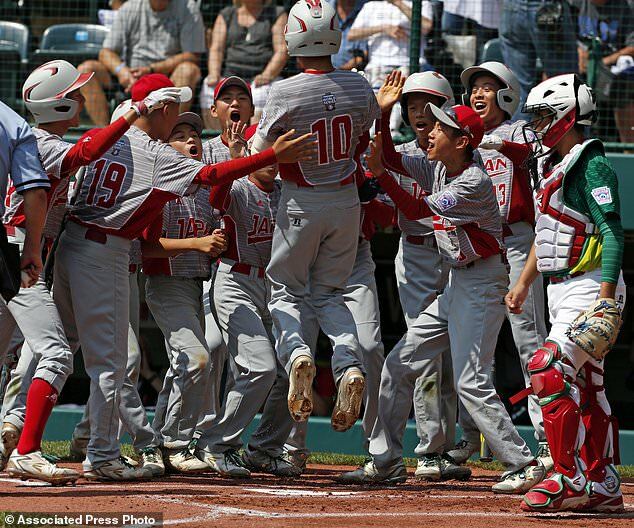 Little Leaguers are allowed 85 in a game. Japan pitcher Riku Goto tossed 5 2/3 shutout innings and struck out 13, the most for a pitcher in a game this tournament. "All I thought about was throwing a shutout," he said through an interpreter. Miyahara relieved Goto for the final out after the starter reached the pitch-count limit. Goto helped his own cause in the fifth inning by singling in a run. MR. OCTOBER FALTERS IN AUGUST: Hall of Famer Reggie Jackson threw out the first pitch, and it wasn't pretty. He wound up and bounced the ball a few feet in front of home plate. STRIKEOUT STUFF: Despite his first-inning struggles, Garcia still featured plenty of put-away pitches in his two-plus innings of work. He had seven strikeouts, including the dropped third strike following Miyahara's home run.